“Zhongyu” is Chinese for “Finally”, so explains the subtitle of this album, referring to much-travelled musician and writer Jon Davis’s long hoped for band fusing Western rock and ethnic Chinese music finally coming to fruition. In partnership with fellow Seattle denizen guitarist Dennis Rea, these two like-minded souls, having both spent considerable time in China, have assembled an American band of high degrees of skill and sophistication merging Western and Chinese instrumentation. Using the Dejoie partnership from Dennis’s band Moraine and well-respected jazz drummer Randy Doak, Jon and Dennis arrange and produce Jon’s compositions in an always engaging manner, calling on Chinese influence as well as modern Western eclectic progressive rock and classical input to produce a captivating whole. In some ways the western oriented Zhongyu could be seen as a heavier flip-side to a coin headed by the more gentle eastern Chinese introspections of Dennis’s delightful View From Chicheng Precipice album. The muse that inspires both main protagonists sails slowly down an imaginary vast muddy river making its stately and unhurried north-south progress between the west and east banks of these two reflective outposts of inspiration. 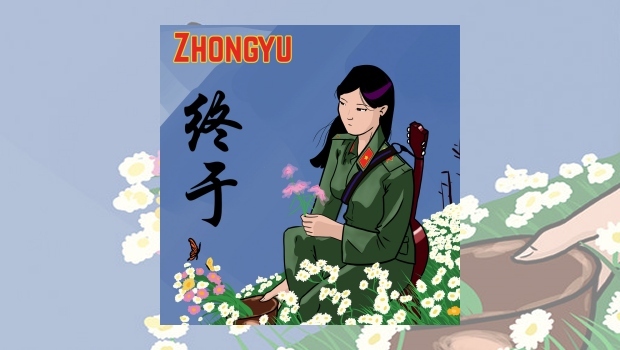 However, while Zhongyu is located on the west facing bank, and makes use of Crimsoid and avant-prog influences, it is also heavily permeated by the eastern influence. An example is the mesmerising interplay of James DeJoie’s bass clarinet and Jon’s ghuzeng, a Chinese zither with a history of well over two thousand years, on Apple Of My Mind’s Eye 1 as it weaves its intricate Oriental mysticism into the tapestry with delicacy and poise. The gentle vibe continues into Half Remembered Drowning Dream that while a quiet piece maintains an underlying tension that slowly rises through the arrangement, subtly pulling from the deep. This segues into Sleepwalking The Dog, where the tension finds release with Dennis, James and Alicia DeJoie putting their instruments through wah-wah pedals to great effect, all the while marshalled by Jon’s effortless Stick work. Those three tracks form a musical movement within the album, and for me this trio of pieces is something of a high point. Elsewhere we venture into RIO territory, with some freeform exploration on the suitably abstractly titled Cat Hair All Over It. This is followed by the rather fine Miles Davis-like MBBL, with some good trumpet blowing from guest Daniel Barry, once again backed by some exemplary Stick playing from Jon, and a fine guitar break from Dennis. This album has by now covered a lot of ground, and because of this it will continue to reveal itself to the interested listener over repeated plays. Zhongyu is a meeting of disparate influences where the whole is definitely more than the sum of parts, both in terms of the line-up of the group, and its many and varied influences, which are listed on the band’s Facebook page as “King Crimson, Univers Zero, Present, Cold Fairyland, Moraine, Mahavishnu Orchestra, Béla Bartók, Stick Men, George Russell” – they left off the Chinese allspice for some reason, but even so, the list tells you nearly all that you need to know. Give it a go, you will not be disappointed.